Similarly, the Puppy Bowl XV is following suit. But instead of trees, the glory goes to puppies [versus trees] who are selected from around the country to participate in the broadcast on Animal Planet. This is the event that mimics the nation’s annual match-up of America’s top football teams. Televised each year on Super Bowl Sunday, the show features 10 canines at play inside a model stadium, with commentary on their “super” game play. The first Puppy Bowl was shown on February 6, 2005, opposite Super Bowl XXXIX. 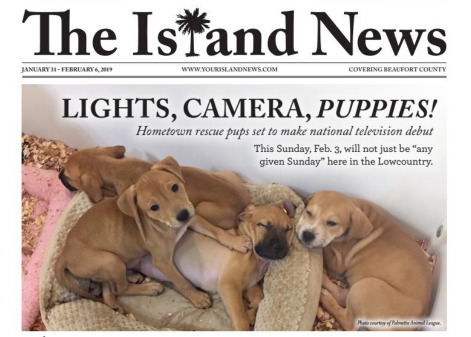 The puppies featured are all from small town adoption centers. Lowcountry resident, the Owens family met and adopted a dog at PAL’s sponsored event last fall. Appropriately naming “Pumpkin” for the autumn season, their personal story became part of a national TV commercial for the Puppy Bowl. “When we brought Pumpkin home, the family was complete . . . it just felt really right,” said 17-year old Caitlyn Owens. The broadcast begins Sunday at 3 p.m. on Animal Planet, February 3. Better yet, join the Puppy Bowl Watch Party at Peacock Subaru starting at 2:30 p.m. If you’re attending the event, in addition to taking in the game, munch on some of car dealership’s delicious tailgate food from One Hot Mama’s. Joining them will be radio station 104.9 The Surf and the PAL. They’ll be bringing additional adoptable dogs along, so you can meet and mingle with all the furry friends available for adoption. Whether you’re adopting or donating, the good folks at PAL will be grateful for any help you can send their way. If interested, be sure to click here to RSVP, and the good folks at Peacock Subaru and PAL look forward to seeing you here!